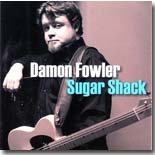 Sugar Shack (Blind Pig) is Florida native Damon Fowler’s debut album for Blind Pig Records, and what a start he’s made! He has released some albums previously Riverview Drive, Roots & Branches, and Live At Skipper’s Smokehouse, but this CD is way out in front in both quality and content. This guy is refreshingly different, and writes a lot of his own material – he wrote nine out of the 12 tracks on the CD – and when he does a cover version, it’s not the run of the mill blues number that gets covered by everyone else, this guy picks things from Merle Haggard! Obviously, people are noticing this young man, he was voted Best Guitarist, Slide Guitarist and Lap Steel Player in Creative Loafing Magazine in Tampa, Florida last year. It’s not difficult to understand why when you listen to this album. Influences would seem to include some swamp blues, Johnny Winter and Duane Allman, amongst others. The CD opens with a bouncy country-style blues “Some Fun,” which nicely demonstrates Fowler’s excellent guitar picking, as well as his songwriting expertise – it’s a good way to start the album and it leaves the listener wanting more. The tempo stays up with a nice boogie blues called “VFW,” another Fowler original which leads into a slow, slow blues – “I Hope It’s Gonna Rain” – moody, well written, and good listening. The slide guitar makes itself known on track four, “Lonely Blues”, a well-balanced rocking blues which shows that Damon Fowler is a mean slide player, up there with today’s best.This shows up well on track six, “Sugar Lee,” as well – a track that I just couldn’t sit still while I was listening. The Merle Haggard cover, “Tonight The Bottle Let Me Down,” is a great up tempo version, and I have to admit that I like this version more than the original!! It retains a little of the country twang, whilst merging a great bluesy background. This is a CD that merits a place in any blues lovers collection, but be warned it could get stuck in your CD player because you won’t want to take it back out!